Very clear points are described as Masculine. They may be optically clear (water clear), or they may have some Fairy Frost. The base of a Masculine crystal may be dense with frost, however if more of the point is clear than cloudy, it is described as Masculine. 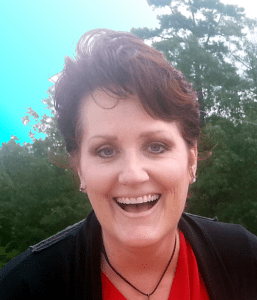 Remember not to have pre-conceived notions. 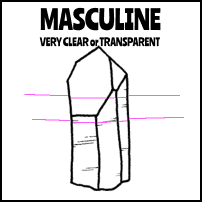 Just because a point is masculine by description doesn’t automatically mean it can only present masculine energy (the same is also true for Feminine crystals). 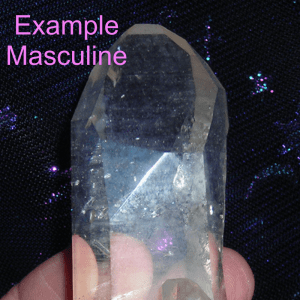 Masculine crystals are helpful when you need to get to the point; they have a sharp and direct energy. Yang in nature, Masculine crystals are more action-oriented and the energy projects rather than recedes. Empathic Arkansas quartz crystal point/cluster, super water clear (Masculine), has Fairy Frost, deeply penetrating Bridges, smaller Inner Child points, large crystal Imprint, small but deep Keys and cluster at the base. This Double Terminated Tabby or Tabular Arkansas quartz crystal point is water clear (Masculine) with Fairy Frost, Mirror Fractures and Lineated Sides.